Over a delicious pizza in Siena we pondered what he wrote about "unnatural" food. I don't think it's a simple matter of "natural vs. artificial," but I do think it makes good aesthetic sense to prefer a fresh Tuscan tomato to a can of Campbell's tomato soup. Super-processed food doesn't taste as good (to me, anyway), but sheer taste is just part of it. The way we experience food also has to do with everything we believe about where it came from, how it was produced, etc. When I'm less jet-lagged I'm going to respond to his post about my book. 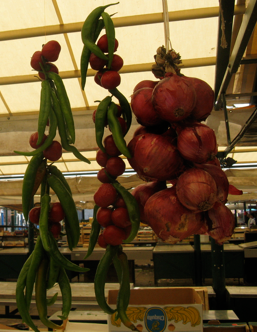 The picture was taken at the fruit and vegetable market in Venice. #2 Last semester when I taught environmental ethics there was much discussion of whether and how we can reduce our ecological footprints. The French and Italians already do many of the things we're supposed to do. They drive smaller cars, use much less air conditioning, live in smaller homes, eat less, use more public transportation, etc. I don't think they necessarily mean to be more green, but rather--for cultural and historical reasons--they simply are more green. Why can't we be more European? #3 What's the point of traveling? I'd like to say it was for expanding our horizons, learning about other ways of life, visiting friends, etc. etc., but the truth is that it's all that, but also just for the fun of gawking ... at great art, architecture, landscapes, etc. Alain de Botton must say some perceptive stuff about these things in his book about travel. 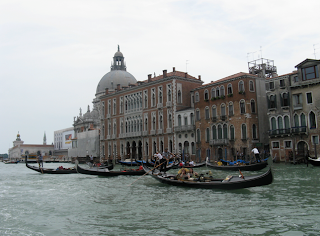 I can't believe how beautiful Venice is. A little Disneylandish? I don't care. #4 Is there a lower moment in human history than the gladiator fights put on at the Roman Coliseum? It's one thing to subject others to death and total misery, but to enjoy yourself completely while doing so is especially appalling. 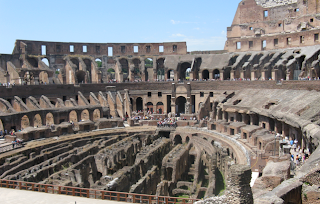 It turns out the Romans (50,000 at a time) not only feasted while watching men and animals kill each other, but they liked to be sprinkled with flower petals and sprayed with perfume. The women brought needlework with them and the men took a little time out for letter-writing. What great engineers they were, but what miscreants. Picture was taken you know where. #5 I shouldn't have taken this picture, I know, but I was surprised to discover that there are culturally specific ways of begging. 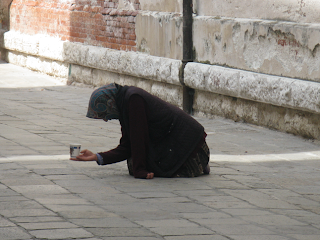 Italian beggars create tableaux straight out of religious art. The homeless in the US (we don't even use the word "beggar") would never try this. A "beggar" in Venice (yes, we paid for the sin of photographing her by giving her money). #6 Our kids were very keen to see "famous stuff." The funny thing about famous stuff is that it's impossible to see it just as is, instead of seeing it as famous. There's a thrill of recognition that's an inextricable part of the experience. Plato and Aristotle detail from The School of Athens (at the Vatican). I'm glad you're home safe and sound, and I'm sure your readers will be relieved to have the Real Author blogging again. It looks like you had a great time. By the way, I think nothing beats a sweet tomato fresh from the garden -- and even better would be to eat it on holiday in Italy. Venice: awesome...yet stinky. It will be sad when it sinks into the water. Prof. Kazez: These are very nice pictures. Did you or someone else in your family take them? 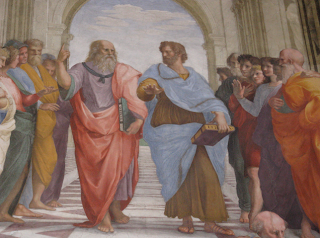 Relatedly, do you happen to have the picture of the Flavian amphitheatre and/or the "School of Athens" in high resolution? Aeolus: Will you still be hanging around despite Prof. Kazez having returned? To have your opinions along with Kazez's would be most interesting, I think. Angus, Variety is the spice of life. I bet my readers enjoyed the change. Re: the home-grown Tuscan tomato. It seems to me its appeal is missing in a lot of food, including both animal products (because of the cruelty) and highly processed non-animal products. Anonymous, We took the pictures--thank you! There have to be high res pictures of both things somewhere on the internet. One of these days I might transform this into a group blog and by all means, it would be great to have Aeolus on board. We see eye to eye on some things, but there's enough difference there to make for interesting debate. 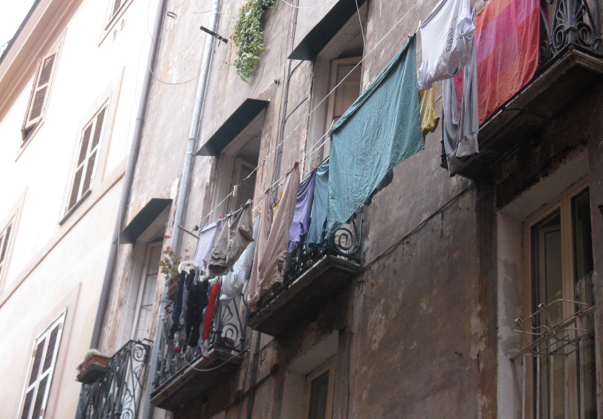 By the way, we Latin Americans also dry our clothes in the sun, use smaller cars, and generally, don't have air conditioning or central heating. Did you find any place in Europe that was particularly difficult being a vegetarian? Paris was tough for me. Rome wasn't too bad, although I ate a lot of pizza. London was really easy. Amos, Yes, same thing in Latin America. You expect that in the poorer countries but it's interesting how it's also true in the richer countries. The fact that Americans are BIG consumers is immediately obvious as soon as you step off the plane back in the US. They even look bigger. Actually, a lot bigger. Wayne, Agreed! The UK is easy for vegetarians, Paris quite hard. We went to one vegetarian restaurant there. Seitan bourgunion (sp?) anyone? Mostly we struggled with menus that had no vegetarian options. Rules had to be bent a little. Rome was much better. If you just skip "secondi" (sp?) you can be in great shape. Lots of pizza and pasta, and great salads and bread. Since coming back we've been eating nothing but Italian food. things, for example, about food or clothing, they don't tend to as wasteful as people in the U.S. do about air conditioning or heating. Customs, as I said above. I recall the last time I was in the U.S., a year ago, freezing in a train from New York to New Jersey because of the level of air conditioning.